Handheld SP400X is the first and only scan-and-print solution to integrate 2-D imaging, inkjet printing and wireless communication in one device. It's designed to simplify high-volume logistic operations centers and postal services that use manual scanning and labeling to sort packages. Handheld develops custom rugged mobile computing solutions like the fast SP400X all-in-one scanner and printer which houses both a barcode scanner and a mobile printer in one device. 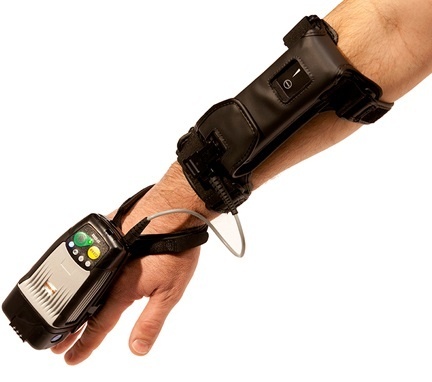 The wearable scanner is one example of our custom rugged computers. Beyond the imprinter, we offer other custom solutions. Call us today to see how we can help with your custom project. The SP400X is an ideal solution for warehousing, package delivery and other logistic-type industries. This portable, robust, easy-to-use and high-performance printing solution prints directly to packages or other surfaces, eliminating the cost and time required for separate printed labels. The SP400X is based on patents and technology that is licensed from HP, a global leader in printing and imaging. And, the device uses genuine HP inkjet cartridges, assuring a clean and highly-legible print each and every time. The lightweight SP400X can complete more than 1,250 scans and prints per hour, scanning and printing at speeds as fast as two seconds per cycle. It operates on a lithium-ion battery capable of delivering up to 7,000 scans and prints per charge. Its 2.5 cm cube print cartridges are designed to output thousands of 0.53" x 2" (1.5 cm x 6 cm) prints. Wi-Fi compatibility integrates the device seamlessly into existing IT environments, allowing it to communicate directly with your back-end system in real time. And for ultimate efficiency, the SP400X prints directly onto packaging, so it costs less and produces less waste than thermal label printing. To operate the device, a user aims the SP400X’s scanner at a 1-D or 2-D barcode, postal code or OCR code to capture supply-chain management information. The SP400X’s integrated Wi-Fi sends the imaging data to a warehouse-management system and receives data sent back to the device. Once the new information is received, the user rolls the SP400X across the area to be printed, and the device applies a fast-drying, smudge-free, non-toxic image directly onto any package surface: plain paper, kraft paper, packing tape, coated labels, polypropylene, polyester or polyethylene plastic. The SP400X Imprinter features a design optimized for ease of use, with hypoallergenic materials for maximum comfort. An IP53 durability rating means this device is protected against dust and water sprays for unimpeded rugged, mobile use throughout supply chain environments. The lightweight SP400X can complete more than 1,250 scans and prints per hour, scanning and printing at speeds as fast as two seconds per cycle. It operates on a lithium-ion battery capable of delivering up to 7,000 scans and prints per charge. Its 2.5cm cube print cartridges are designed to output thousands of 0.53" x 2" (1.5 cm x 6 cm) prints. Wi-Fi compatibility integrates the device seamlessly into existing IT environments, allowing it to communicate directly with your back-end system in real time. And for ultimate efficiency, the SP400X prints directly onto packaging, so it costs less and produces less waste than thermal label printing. Note: Orders with total value less than @ £100GBP will be subject to a handling fee of @ £10-00GBP. Software included Setup and maintenance applications. Print template designer. Device drivers. Battery Lithium-ion battery; more than 6,000 scans and prints over 6 hours on a single charge.